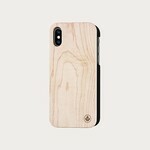 The iPhone case is designed in order to be very thin while keeping your phone safe and protected. The case is laser-cut, sanded and then finished with oil to create a raw but refined look. The Walnut or Maple iPhone Case changes your iPhone into a statement of craftsmanship and design and is easily applied and removed. Available for iPhone X, iPhone 8, iPhone 8 PLUS, iPhone 7and iPhone 7 PLUS. This product is made of natural wood, making each case slightly different in colour and texture and truly unique.